‘SPACEBUSTERS’ – A Logistics Publicity Campaign produced for Boots the Chemists by Audio Visual Communication, written and created by Peter Gibbs. THE SPACEBUSTER CHALLENGE – Every year Boots the Chemists trunks the equivalent of three Wembley stadiums full of fresh air around the country – who’re you going to call – ‘Spacebusters’. ‘DRUG TARIFF – THE MOVIE’. The dispensary’s final frontier. 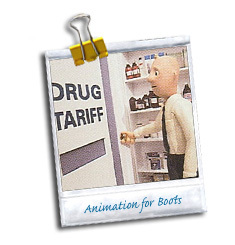 An animated film produced by Audio Visual Communications and A.R.Animation for Boots the Chemists, written by Peter Gibbs. ‘HALFORDS GRAND PRIX ROADSHOW’ – Christmas ’97 – Presentation and Training Video for Halfords retail staff. ‘No 17 SELF SELECTION COSMETICS ROADSHOW’ – Launch presentation of new in-store merchandising units. Presentation and video inserts written by Peter Gibbs for Boots the Chemists.